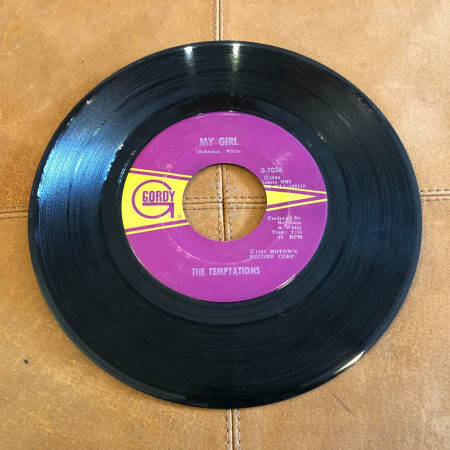 Up for sale is a vintage 45 RPM record of The Temptations’ hit songs “My Girl” and “(Talkin ‘Bout) Nobody But My Baby.” Aside from some light surface scratching, this record is in good condition. Sold as is, no international buyers. If you have any additional questions regarding this listing, feel free to ask. Thank you! No picture sleeve. Light ringwear. We ship within 24 hours (6 days a week). Vinyl VG-. Side A label partially torn (right side - song title / artist / label still legible). Ringwear / writing on labels. We ship within 24 hours (6 days a week). Extreamly Rare Picture sleeve in very nice condition!! !